Things to do before you die: You like me, you really like me. 5. 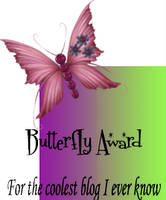 Leave a message for your awardees on their blog. According to Malika. I have to give it to her, she's not only (sometimes painfully) honest but she's damn funny. The Fabulous Matriarch Does Life. The more I read, I more I like. I can definitely relate. TwentyEight30. I came across this blog by accident. If you get a chance you should read this one. It's truly good stuff. Anyway, I'll dole out some more. Just my small way of saying thanks! More list adventures coming soon...only 6 days until inauguration!